Every year, I try to boost my own crafting skills by taking classes, reading books, and challenging myself to learn new things. It’s easy to make the same projects over and over, but sometimes that causes us to lose our passion for the crafts that we love. I’m lucky enough to live in New York City, so I have access to many amazing yarn shops, teachers, and events. But not everyone has so many crochet and knitting resources at their fingertips, and even I struggle with finding the time for it all. Enter Craftsy. 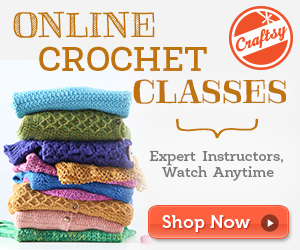 In addition to being a marketplace for patterns and crafting supplies, Craftsy also offers an incredible array of online classes in crochet, knitting, sewing, baking, photography, and pretty much every other craft imaginable. You can keep your skills fresh by taking classes on your schedule. My review of Custom-Fit Tunisian Crochet, taught by Dora Ohrenstein. Image © Craftsy. Guest post by Lindsey Stephens, teacher of Seaming Crochet. Image © Craftsy. Interview with Beth Graham, teacher of Fun & Fantastic Textured Crochet Stitches, on the Crochet Guild of America blog. I have my eye on some other classes, too. Have you ever wondered what Craftsy classes other people are taking? Not only have I taken Craftsy classes and enjoyed them, but so have other Underground Crafter readers. Recently, Craftsy shared a list with me of all the classes Underground Crafter readers have bought through my affiliate links, and today I’m sharing that list with you! Crochet Mittens & Fingerless Gloves, taught by Brenda K.B. Anderson. Knit Faster with Portugese Knitting, taught by Andrea Wong. Sewing Designer Details with Simplicity, taught by Joy Macdonell. What Craftsy classes have you taken? Which ones are on your wish list? Previous Previous post: Roundup: 15 Free Crochet Hat Patterns for National Hat Day!